After seven years of use, I noticed that my slide-out awning cover known as a Slide Topper was deteriorating. The fabric section that was exposed when the Slide Topper was rolled up was brittle and beginning to crack at the awning rail where it was attached. In addition, the material is made from layers of material laminated together and these were beginning to separate with the upper portion flapping in the wind when the slide-out was extended. 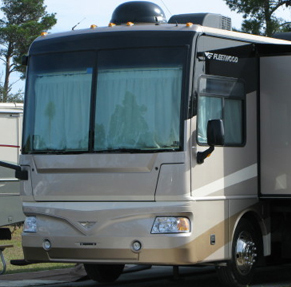 The unit we had on our coach was an A&E brand 8000 Deluxe which did not have a metal wrap over the material. I discovered in my research (reading the material that came with the motorhome " what a concept!) that the slide topper should be 8" longer than the slide out box. When I measured the material I found that it was the same length as the slide out. On the surface I thought that I had a shorter topper than required. However after observing other coaches and looking carefully at my coach, I discovered that the material was about 7" longer than the actual box. I had been measuring the slide out from end to end on the outer edge and that dimension included the two large moldings that contain the slide out rubber that fit against the body. When I actually measured the "box" I discovered that it was about 8" less than the awning fabric. When ordering a new Slide Topper: Be careful! Give the dealer the awning material length and the (shorter) actual slide out box length. If you give the dealer the fabric dimension he will order a Slide Topper 8" shorter in length since they use the slide out box as the dimension for determining the Slide Topper size. I decided to order the A&E 8000 Elite which included the metal wrap on the portion of the awning closest to the coach body. I did this for two reasons: First it would provide physical protection against sun and UV damage and it would also provide protection against damage from low lying tree limbs when parking the coach in tight campsites. Secondly, it also matched the main awning which had a metal wrap on it. I had the choice of ordering just the material which seemed like the right choice on the surface however to remove the old and reinstall the new material would add about an hour to the labor charge. This was almost the exact difference of the cost of a completely new Slide Topper. Ultimately I chose the complete replacement, and as you'll discover that was a wise choice. One item I had not taken into consideration was the fact that the new Slide Topper with the metal wrap was larger in diameter than the old one. While this would not seem to pose a problem I was told that it should be mounted 1" lower on the slide. This would have meant new mounting hardware locations and old holes to be sealed. Ultimately we decided that if there was any interference we could shim the Slide Topper to provide the required clearance. It was tight and shimming seems to have resolved the clearance issues. The reason that replacement of the complete Slide Topper was a wise choice was that the spring providing the tension on the roller tube on the original unit had lost much of its strength. This had resulted in the awning sagging and the rain collecting on the top surface. I had assumed that this sagging was the result of the material stretching however; it turned out to be the weak spring. Had I replaced just the material I would have discovered that the spring needed replacement and had to remove the roller tube. This would have resulted in double the labor cost and a higher price for the roller tube than if I had purchased the complete awning. Sometimes you are just lucky, or you do make the right decision. Should you be faced with a similar slide topper replacement hopefully this information will be helpful in making your decision. why don't they make the slide toppers longer,so they keep out the rain better?